The challenge over at Dynamic Duos (http://thedynamicduoschallenge.blogspot.co.uk) this week is to use the two colours Melon Mambo and Black with the option of a theme of umbrellas . As I haven't any stampsets of umbrellas I couldn't do that but I do have some stunning Melon Mambo embossing powder which I decided to use. I am sorry that the light is not better but it was a very grey day yesterday when I made the card. The card was very easy and quick to make. 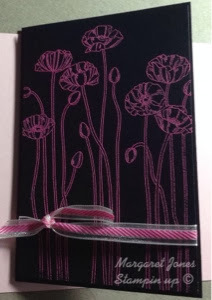 I used the lovely stamp Pleasant Poppies and stamped it with Versamark before using the Melon Mambo embossing powder on Black card. I then tied a piece of Melon Mambo ribbon around it and stuck it on top of a black card. It didn't take too long at all. 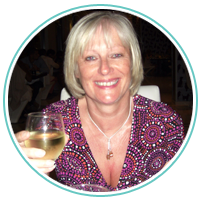 Tomorrow sees the start of Sale-a-bration and the launch of the Spring catalogue so please come back tomorrow when I will give you all of the detail of how to get free products. Beautiful embossed poppies! Lvely design, too! Thanks for joining the DD!